Geraniums are beautiful and extremely popular flowering plants that grow well both in the garden and in containers. 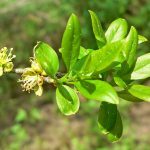 They’re popular for their bright and sometimes fragrant flowers, but they bring with them the extra bonus of being especially good companion plants. 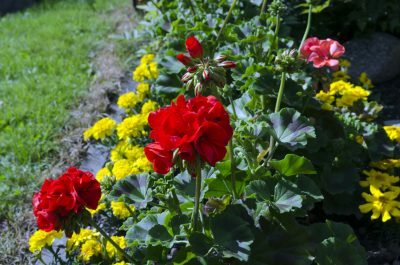 Keep reading to learn more about companion planting with geraniums and what to plant with geranium flowers. Companion planting with geraniums is so beneficial because they deter some very common and destructive pests. Geraniums are known to repel earworms, cabbageworms, and Japanese beetles. Because of this, the best companion plants for geraniums are those that are prone to suffering from them, like corn, roses, grapes, and cabbage. Scented geraniums are also believed to deter spider mites, leafhoppers and cotton aphids, meaning good scented geranium plant companions are almost any vegetable in your garden. Spider mites, in particular, can devastate most vegetable crops in the heat of summer, so most plants will benefit from having geraniums blooming nearby. For effective pest control, plant a border of geraniums around your vegetable garden or simply plant them interspersed among the vegetables, especially near plants that have suffered from pests in the past. 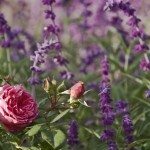 Plant them near rose bushes to keep the bugs at bay and to create an attractive floral accent. Even if you’re not looking for pest control, geraniums are stunning in their own right and can be paired effectively with complimentary colors. Geraniums come in a wide range of colors, and it’s up to you how you’d like to complement them. Chrysanthemums, for example, are a great choice for geranium plant companions if you want a show-stopping bed of big blossoms in lots of hues. Most any annual or perennial sharing similar growing conditions will make an exception neighbor to geraniums.